The clues that selenium is protective of cancer date back many decades. 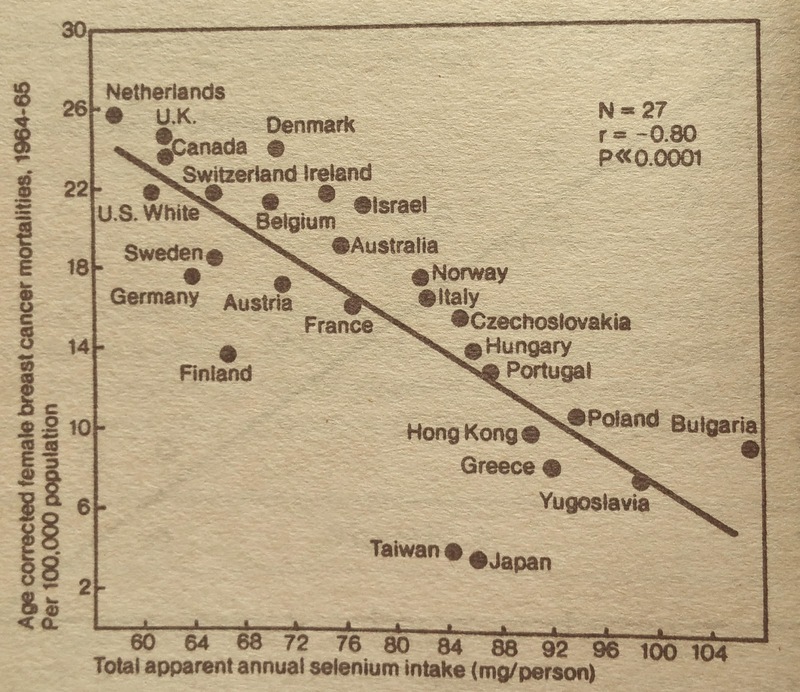 In fact evidence in the nutritional literature dating back to at least the 1970’s suggests that low selenium diets increase the risk of cancer significantly. Selenium is protective of cancer, possibly because it is required as a cofactor for the cellular antioxidant glutathione peroxidase. Low selenium diets cause significant reductions in plasma levels of glutathione peroxidase, and this likely increase oxidative stress in cells and may cause damage to DNA, which initiates cancer formation. Low selenium crops may cause low intake of selenium in a given population if that population relies on that crop as a staple food. However, selenium is also present in meat, with fish being a particularly good source. 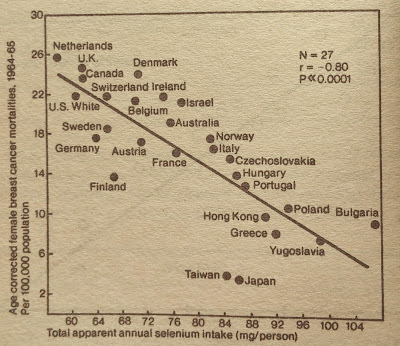 Epidemiological studies show that as intakes of selenium drop, breast cancer rates increase significantly1 (figure 1). Studies on rodent confirm that low selenium diet cause significant increases in cancer rates amongst the animals. Figure 1. The inverse association between selenium intake and breast cancer mortality1. Soy in your Whey Protein? How Do Vitamins and Minerals Work?